LUGOGO – Hours after being named the new Federation of Uganda Basketball Association (FUBA) president, Nasser Sserunjogi has vowed to take the game to schools’ level. 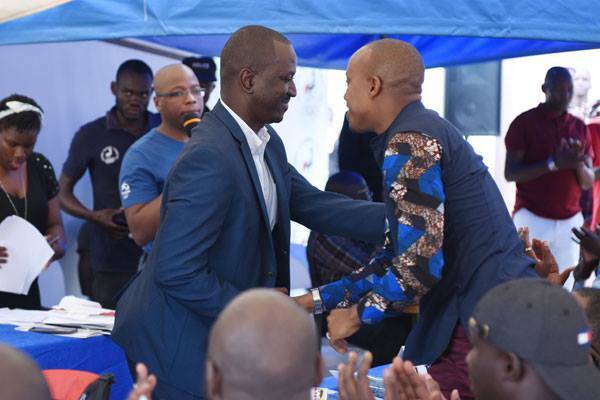 Sserunjogi was voted into office on Sunday, 24-02-2019, during the federation Annual General Meeting held at the Uganda Olympic Committee offices in Lugogo. The KIU Titans patron got 37 votes to beat City Oilers’ Grace Kwizera who in turn collected 24 votes. “We need to take the game to schools, both primary and secondary. Said Sserunjogi. “We will co-operate with games teachers to ensure that basketball is played there. “We shall start with the schools in central then later we will traverse the whole country. Sserunjogi along with his new executive that has Hudson Ssegamwenge (Vice President, Administration), Aggrey Mbonye (Vice President, Finance), Arnold Katabi (Vice President, Marketing), Sunday Joseph Manano (Vice President, Techincal & Competitions), Stephen Nyeko (Youth Commissioner), and Sandra Munduru (Women Commissioner) will steer basketball for the next four years.